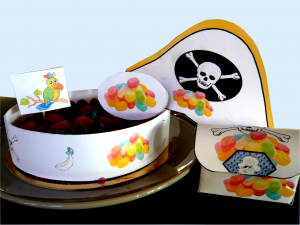 Yo ho ho me hearties ! This is a great fun kit for kids between the ages of 3 and 6 that would love to discover the world of pirates. 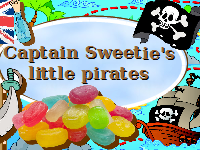 They are introduced to Captain Sweetie through a colouring page, games, a story and finding and piecing together his treasure map. Of course his map contains the clue to tracking down his final message in a bottle, which eventually leads them to his treasure chests full of sweeties !